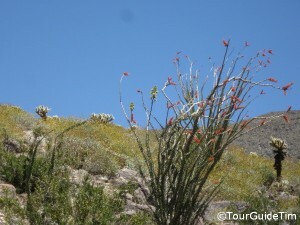 Anza-Borrego Desert State Park - TourGuideTim Reveals San Diego! Visitor Center Hours: 9AM – 5PM; Thursday through Monday From October to May; Weekends from June to September. Features: Sonoran Desert Meets the Peninsular Mountain Ranges Creating the Most Diverse Desert Landscape in the World and offering Hiking, Camping, Horseback Riding, Desert Wildflower Viewing, Stargazing, and Geological Exploration. 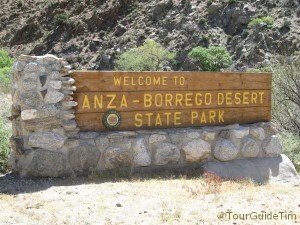 Anza-Borrego Desert Highlights: The Anza-Borrego Desert State Park encompasses 600,000 acres (938 square miles) in the eastern part of San Diego County, making it the largest State Park in California. It starts near the border with Mexico on the southern end and stretches north about 54 miles nearly reaching the Salton Sea. Running along its entire western edge are the Peninsular Mountain Ranges of the Cleveland National Forest and Cuyamaca State Park. Anza-Borrego State Park is part of the 2,500 square mile Colorado Desert, which covers the eastern portion of Southern California and Baja Mexico. In turn, the Colorado Desert is part of the 120,000 square mile Sonoran Desert, which includes southwestern Arizona and Sonora Mexico. 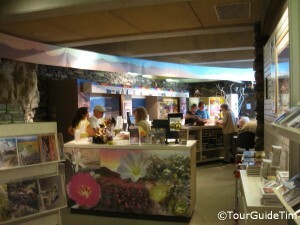 Most travelers head straight for the Visitors Center in Borrego Springs. (See Directions below.) Here you will find an Interpretive Center and Gift Shop. 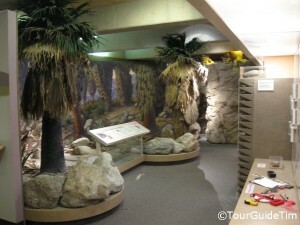 The Interpretive Center provides a number of displays, photos, and videos teaching visitors about the desert. They give visitors an appreciation for the varying landscapes of the desert as well as the colorful spring flowers that often cover parts of the Desert floor. Park Rangers and volunteers are on hand to provide maps and advice on visiting different locations in the Desert. You will also find plenty of books, videos, and pictures for sale, interspersed with the displays at the Interpretive Center. Visitors tend to spend anywhere from a half hour to an hour inside the center. After learning about the Desert and buying a few souvenirs, many guests go for easy hikes on the trails that surround the Visitor Center. 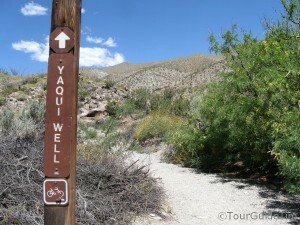 These nearby trails offer signs with descriptions of the various desert vegetation, such as cactus and palms. 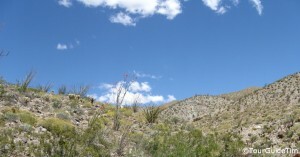 The Anza-Borrego Desert is regarded as one of the best paleontological sites in North America. One of the areas where you can see the fossils of ancient animals is the Carrizo Badlands. Also, keep your eye out for wildlife. Hawks are one of the more prominent species you will come across. You may see deer, fox, road runners, and rattlesnakes. If you are lucky, you will also see the elusive Bighorn Sheep. After a few hikes, some travelers decide to call it a day and head back home. 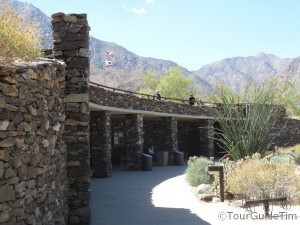 A handful of visitors will stay at one of the hotels in the Borrego Springs area so they have time for more exploration. Others who are more adventurous and want to enjoy some peace and quiet will find a campground or find some desolate location in the vast Park and set up camp for the night. However long you decide to stay, this is one of the more memorable experiences you will have in life just for the fact very few people ever venture out to a Desert. It certainly provides a change of pace. The vast desert scenery may not seem all that exciting, but it is hard to forget. Below, you will read about a number of activities that will keep you occupied and enrich your desert experience. It is best to visit during the winter months. There is the occasional rain storm but daytime temperatures are near perfect between November and April. You will encounter a fair number of days in the 100s in October and May. For the summer months from June through September, high temperatures average over 100 degrees. Learn more about weather in the San Diego Desert or check the current Desert Weather Forecast. The Desert is Very Dry so bring LOTS OF WATER. Great views of the expansive desert, especially if you enter using the mountains from the west. Once you are in the Desert, you will have nice views of the mountains to the west and north. Visitors often include a trip into the nearby historic town of Julian on the way to or back from the Desert, to stroll along a quaint street full of shops, restaurants, and attractions. Those with disabilities can also enjoy the desert. 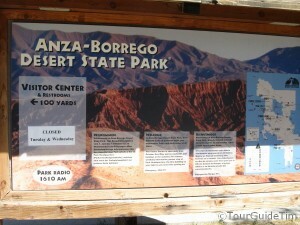 Learn more on the State Park accessibility web page for the Anza-Borrego Desert. Anza-Borrego Desert Map – Here is a printable map that shows roads, established camp sites, and some of the hiking trails. Video Guide – Watch this four minute video from the Anza-Borrego State Park web site. Despite the small, somewhat hard-to-see video, it is worth the look to see and hear why geologists and paleontologists come from all over the wold to visit the Anza-Borrego Desert in San Diego County. You should also check out this four and a half minute video of Borrego Springs and the surrounding desert from the San Diego CBS affiliate, channel 8. Educational Field Programs – So few people ever get to experience and learn about deserts. Take advantage of day-long programs provided by the Anza-Borrego Foundation and Institute. Field Programs include such topics as reading tracks in the ground, hiking along the Pacific Crest Trail, and exploring the Salton Sea. Workshops cover topics such as photography and astronomy. Field Programs are taught by professionals, including PhD.s. and generally cost from $35 – $45. Borrego Birders – Birds in the desert are not the same ones you see back home. 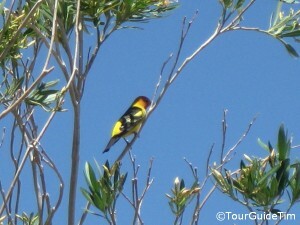 For those who like birdwatching, look for a sign at the Visitors Center for the next Borrego Birders tour. The walking tour generally takes place the 1st and 3rd Wednesday morning of each month, except during the summer. 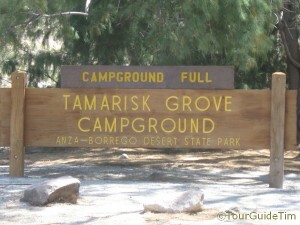 Camping – There are four developed camp sites at Anza-Borrego, including a horse camp. Rates run $20 – $30 per night, which does not include a $6 per day vehicle fee. Camp sites do sell out a few weeks in advance during winter weekends. Desert Wildflowers – Some years, the infrequent winter rains bring just enough moisture to create an impressive display of spring wildflowers sometime between late February and mid-April. You will see pictures and travel articles on the Anza-Borrego wildflowers in the national newspapers during the good years. If you have never driven out to see the desert wildflowers, set your expectations appropriately. Despite the national attention, don’t expect to see an entire desert full of wildflowers as you drive down from the mountains. This is not a manicured botanical garden. Instead, you will see patches of various colors spread throughout the desert. The flower patches are big and provide an impressive display but when placed with the backdrop of a vast desert where you can see for miles, they look pretty small as you approach Borrego Springs. To help find the best locations and peak times, you should call the State Park’s Wildflower Hotline at 1-760-767-4684 for a recorded message or check out Carol Leigh’s Wildflower Hotsheet. 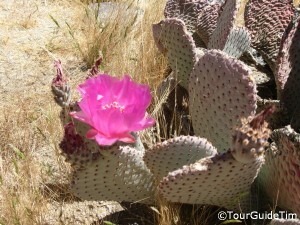 As you enter the Desert, start your wildflower excursion at the Visitors Center, where you will receive the most up-to-date information for the best viewing areas on that particular day. To learn more about Desert Flowers, print out the “Wild About Flowers” graphic attached to this Wildflower Guide from the San Diego Union-Tribune. Off Highway Vehicles – Off-road Vehicles are not allowed to use Anza-Borrego Desert State Park. However, licensed vehicles such as those with a 4-wheel drive may use any of the over 500 miles of dirt roads within the Park. (Keep an eye out for flash floods.) ATV and other such vehicles can be used in the Cleveland National Forest to the west and the Ocotillo Wells State Vehicular Recreation Area to the east. Juan Bautista de Anza National Historic Trail - The namesake for the Anza-Borrego Desert led a Spanish expedition of 300 travelers in 1775 from Nogales, Arizona to San Francisco, CA. Their route brought them through the San Diego Desert on their way to settle Northern California and establish Catholic Missions. You will see signs along SR-78 and SR-79 marking this National Historic Trail. (See the full route map and a guide to the San Diego portion on a web site established by one of the descendants of the Spanish expedition.) To learn more about the history of this expedition and get additional details, visit the National Park Service’s home page for the Juan Bautista de Anza National Historic Trail. Lodging – Visitors can set up a tent for free anywhere in the Anza-Borrego State Park. Those who are looking for basic lodging can find inexpensive motels while those looking for first-class creature comforts can stay at one of resorts, some of which offer spas and golf. Despite having the widest range of lodging options you could ask for, there are fewer than a couple dozen hotels and vacation rentals to choose from. It behooves you to make your reservations weeks in advance. Otherwise, bring your tent. You will see the full list of offerings on the Borrego Springs Chamber of Commerce web site. Food – The Borrego Springs Chamber of Commerce web site lists most of the cafes and restaurants available in Borrego Springs and the surrounding area. There is no cost for stopping by the Visitors Center or parking along the road near hiking trails unless you park at one of the developed campgrounds where a $6 parking fee is charged. 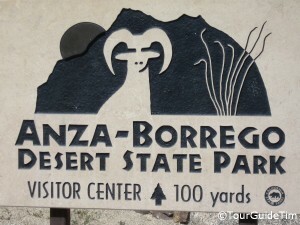 Anza-Borrego Desert Web Site – Get the State Park brochure and more details about visiting the largest contiguous state park in America. You can also call them at 1-760-767-5311. Directions from Google Maps to 200 Palm Canyon Drive in Borrego Springs, CA 92004. (This is the address for the Visitors Center in Borrego Springs, which is a little north of the center of the State Park.) Most visitors from the San Diego area drive through the historic mountain town of Julian and use SR-78 to reach Borrego Springs. For those who like the solitude of a long desert drive, you can enter at the south end of the Desert Park on the S-2 from highway I-8. It’s a very quiet 60+ mile drive through the Desert to reach Borrego Springs. However, you will pass by the Carrizo Badlands Overlook where fossils of mammoths over 1 million years old have been found, Agua Caliente Hot Springs County Park, and an original Butterfield Stage Coach Station at the Vallecito County Park. If you take a route through the mountains near Julian, keep an eye out for possible mountain snow in the forecast, when tire chains may be required to get through the mountains. Slower vehicles should look for occasional pullouts to allow faster traffic to pass. There is very little traffic once you reach the desert. Also note, the State of California places restrictions on motorhomes over 40′ in length. 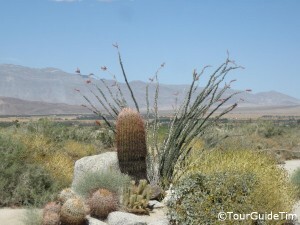 Related Attractions – Learn more about the town of Borrego Springs. Cyclists should check out bike ride events in the San Diego Mountains and Desert. Within Borrego Springs, both the Anza-Borrego Foundation and the Anza-Borrego Desert Natural History Association have organized cycling events on some weekends from October-May. You can check the events page on their sites, THEABF.ORG and ABDNHA.ORG. Question: Is a small street legal, properly licensed to drive on California streets, motorcycle permitted in Anza Borrego on the same dirt roads allowed to licensed 4 wheel drives?